For first time Rolex owners, many are surprised at the simplicity of setting a mechanical watch. Unlike setting a battery powered digital watch looking for flashing numbers and specific buttons to push, setting a Rolex requires a simple turning of the crown until the hands reach the desired AM or PM time such that the date progresses at midnight. Before setting your Rolex, it is good to have the watch wound first. The best way to insure that the watch is wound is to unscrew the winding crown counter clockwise (to the left), then when the crown is unscrewed and in the first position, wind the crown clockwise 20 or so times, or until you feel resistance in the winding crown. Because the Rolex’s mainspring slips inside the barrel when the watch is fully wound, there is no way to “over-wind” the watch. The term “over-winding” is a misnomer based on when watches stopped because they required service despite being fully wound. Once the watch is fully wound, pull the crown out to the next position and rotate the crown clockwise until the date in the date window progresses to the correct date. Prior to setting the correct time, look for an accurate reference time to synchronize your Roles. Many people use www.time.gov or an atomic app on their smart phone. Either way, you will need a reference clock to synchronize your Rolex. To set the time, wait for the second hand to reach the 12:00 o’clock position, then pull out the winding crown out to the last position. The second hand will stop at the moment the crown is pull out to the last position. This “hacking” ability ensures accurate synchronization with your reference time. Once the winding crown is out in last position, rotate the hands to either the AM or PM, depending on the time of day it is. 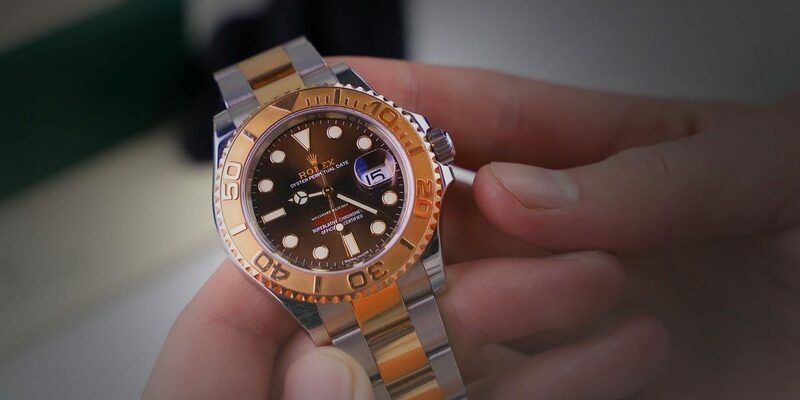 Rolex wearers have posted on watch forums that their date changes 12 hours early or late because they have not realized that when they set their watch that they did not account AM or PM. Once the hands are in AM or PM, rotate the crown until the hour hand is at the correct hour, and the minute hand is at the correct minute. In order for the minute hand to line up correctly with the minute has mark on the watch dial, roll the crown and minute hand slightly ahead of the desired minute, then roll it back to the appropriate hash mark. Many Rolex wearers set their watch slightly fast, then wait for their reference time to catch up, and when the two are in sync, depress the winding crown which releases the second hand at the precise moment. If you know that your Rolex runs loses time over the course of the month, many people set their Rolex fast a few minutes so that their watch is never behind. Because one has to reset the date every other month to account of 30 or 31 days, many wearers will set their Rolex fast over the course of two months so that when they have to reset the date, they can roll their minute hand ahead for the next two months. Screw the winding crown back into the watch tube/case until it just stops. The Twinloc or Triploc seals will take care of the rest.